Check out fundraising posts on the subject of Thanksgiving, Black Friday, and #GivingTuesday. In the spirit of the upcoming holiday, we would like to express our gratitude for YOU, our dear, loyal Friday Fundraising reader! Have a happy and safe Thanksgiving weekend! Here is an oldie but a goodie by Fired Up Fundraising. Thanksgiving is the perfect time to thank and steward your donors. Show them your appreciation for all that they have done for you this year! Pursuant draws on the example from outdoor retailer REI, who recently announced they will be closed on Black Friday, to demonstrate how your organization can make meaningful updates to your own fundraising strategies in a bold, impactful way. Is your organization participating with #GivingTuesday? If so, be sure to read through Annual Giving Network’s #GivingTuesday checklist to ensure you are ready for the big day! According to the Association for Healthcare Philanthropy, donations from grateful patients now make up over 20% of total healthcare contributions. Giving has become an important way patients give thanks to caregivers for their quality care. Raising funds from former patients requires significant coordination to increase results. It also requires navigating privacy laws and coordinating data from an ever-changing donor base that continues to interact with you. Employing these strategies helps build a solid pipeline to identify major donors. 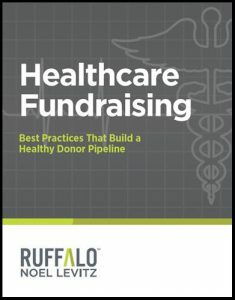 Check out our white paper to explore important healthcare philanthropy concerns and read best practices for raising funds in this constantly changing environment.